Semtech has introduced a spread spectrum radio transceiver which also supports GFSK modulation in the one device. The attraction of using spread spectrum radio is its immunity to interference, an increasingly important factor in the increasingly populated ISM-bands such as 470MHz and 868MHz. Spread spectrum technology has not always been cost-effective for low cost industrial networking applications such as sensor networks and smart metering. Semtech says it has developed a radio platform, called LoRa, it spread spectrum radio devices that will increase immunity from sub-GHz LTE signals in industrial networking bands. The roll out of 4G/LTE mobile networks next to the traditional 868MHz frequency band commonly used in Europe creates increased interference for security systems, smoke detectors, lighting control, home automation and smart meter applications. The devices deliver over 100dB of blocking immunity to out-of-band interfering signals. Additionally, the SX127x family has a 25 dB improvement over FSK devices for rejecting in-band interfering signals. This makes the device especially effective in industrial, scientific and medical (ISM)-band applications such as security and metering because it provides immunity from sub-GHz frequency 4G/LTE signals. The SX127x family achieves a range of more than 15km (9 miles) in a suburban environment and 2 km to 5 km (3 miles) in a dense urban environment while operating under US, EU, Chinese and Japanese regulatory limits. Most deployed systems for metering, security or industrial automation are limited in range to 1-2 km (less than 1.25 miles) in a suburban environment. 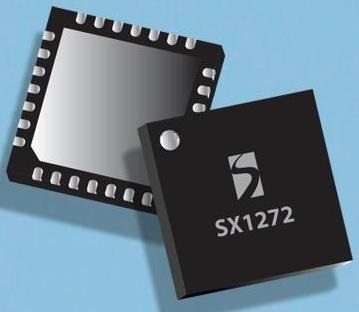 The SX1276 covers all the major sub-GHz frequency bands while the SX1277 is targeted at applications that utilise data rates from 5kbit/s to 40kbit/s such as security systems.